During an emergency, staying connected and informed is vital for the safety of you and your family. While radio and television remain some of the best ways to learn what is happening during times of emergency, I strongly recommend one more vital tool to keep you informed: Twitter. The value with Twitter is it can help condense information you need into a quick bite of information that is relevant to your immediate needs. Let’s take an example of a power outage. Not too long ago, my neighbourhood had a power outage during a major cold snap. While it wasn’t a big emergency, local media was reporting on the cold and some cases of power going out, but nothing specific about my area. By searching on Twitter for the power utility in my region, I was able to see from their Twitter feed they were dealing with a number of outages at the time. I was then able to Tweet to them that my neighbourhood was affected, and not long later I saw a tweet that they were aware of the outage and had a crew looking into it. In a subsequent tweet, the explained there was a blown transformer and the crew gave an ETA on when they expected it to be fixed. This is information that I would not have found on local news media because it was such a small area, but using twitter, I was not only able to learn about the issues, I was able to directly let those know that this area needed assistance. You will notice I use the work OFFICIAL a lot in that list. The reason is with Twitter, it’s so easy to see something and retweet it. If you come across some information you want to reshare, you need to be sure it is accurate information. Too often hoaxes, wrong information or misinformation is sent out that could be harmful if followed. Sometimes it’s by accident, other times it’s on purpose. If you follow official accounts you stand the best chance of getting the right information when you need it. Now that you have followed those accounts, make a list. Twitter allows you to make lists of specific topics and add those accounts to that list. By viewing the list in Twitter you can have a condensed list of all the tweets that should be related to the situation. There shouldn’t be any additional chatter from other accounts you follow so there is no need to scroll through irrelevant stuff to find the information you need. Using #Hashtags is another great way to find out what is going on during an emergency. A Hashtag is a tag which you use to find other tweets on the same topic. As people write out a tweet, they will include the # symbol, followed by a short message related to the topic. When you search for the hashtag, you will see all the tweets using the same hashtag. As you follow your trusted sources, watch to see what hashtags they use in their tweets. In my area, during any weather related emergency, the common hashtag is #ONSTORM . By searching for this hashtag, I can see what everyone is talking about related to this topic. Hashtags are where you will get a lot of information, but just remember, this is where the false information can also be seen, so make sure to take it with a grain of salt, unless it comes from one of your trusted sources. You can monitor the conversation, or jump in and share what you are seeing or what is happening in your area. Remember, Twitter isn’t a one way conversation. While it’s great for keeping you informed during an emergency, it is also vital to keep your friends and loved ones apprised of your situation. Instead of everyone calling you to ask if you are doing okay, you can send out a tweet with an update on how you are doing. It will help keep the phone lines free in case they are needed. So, why did I insist you install Twitter on your smartphone? Your TV may go out during an emergency, and not everyone has a radio with them all the time (Although there should be one pretty close by that takes batteries) but even with a power out, your smartphone should still work. If your home Internet goes down, your smartphone should be able to connect to a cell tower. Chances are your smartphone is with you most of the time, so it’s your best lifeline during an emergency. If you are finding the phone network is getting congested and phone calls are having trouble connecting, or if the data network is running slow, you can also make Twitter updates by SMS, making Twitter one of the most versatile forms of communicating information. Twitter (and other social media networks) have matured enough that they should be considered an important part of any emergency preparedness plan. They keep you informed and connected, which in an emergency could save your life. I put together a How to video detailing how to program SIP compliant phones for an Asterisk based VoIP Phone System. In this demonstration, I am using PBX in a Flash with IncrediblePBX as my server. It uses FreePBX as the web interface on top of Asterisk, making it much more user friendly than the command line or via text. With a test extension already set up, I use a Cisco SPA504 phone for demonstration. Any SIP compliant phone will work with Asterisk, but I have always found the Cisco SPA series of phones to be easy to set up and visually quite nice sitting on a table. I have used Snom, Grandstream and Polycom before with success, and have heard a lot of good things from Digium and Aastra phones. If you are looking to test out a system before deploying it full on, I actually recommend picking up a simple Analog telephone adapter, such as the SPA112. It has 2 ports for analog phones, and 2 SIP registrations, so its great for doing initial testing. While the system I am using in the video is PBX in a Flash, the latest version from the IncrediblePBX team uses Elastix as its interface. I have an instructional video here on how to set it up, and do recommend giving it a try. If you like these videos, please Like and Share them with your friends, Circles and Tweeps! Don’t be shy about leaving me a note in the comments section on YouTube. I’d like to hear what you think so I can bring you more videos to help you stay connected! For many years, I have talked about the virtues of Voice over Internet phone systems for small businesses, and temporary offices, and how they can provide you with an inexpensive alternative to traditional phone lines. Many of my colleagues and clients have come to use them and enjoy how well they work. For just the price of a low end desktop computer (New or used, it doesn’t matter) and some VoIP enabled phones, you can have all the equipment you need to be up and running. As an example of how easy it is to get started with a VoIP based PBX, check out my How to video on installing Elastix 2.5 and IncrediblePBX11 on a computer. All the software is free for download, and comes pre compiled and ready to go. You only need to configure it for your specific details. The above video goes through the process of installing the system on your computer. Once it’s installed, you need to configure it. The next video in my series talks about setting up trunks on the system. Trunks are like phone lines. A trunk can allow 1 line in and out, or it can have many, all depending on what you have subscribed to with your VoIP provider. For those who have trouble reading the text I’m entering into my screen, here is a recap. Don’t worry if you don’t understand it all right now, it may look intimidating, but it really isn’t too bad. This is just example text, but you will need some information similar to this from your VoIP provider. 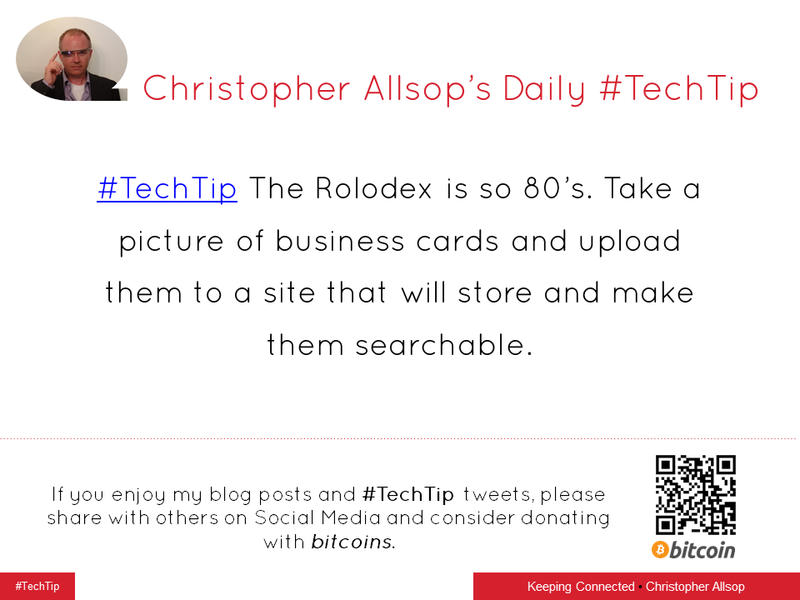 #TechTip The Rolodex is so 80’s. Take a picture of business cards and upload them to a site that will store and make them searchable. Everything is searchable these days on the internet and on your Smartphone. shouldn’t your list of new contacts also be? It wasn’t that long ago I used to have a big book that I slid in all of the business cards I collected from networking functions. They were great for seeing them as I flipped through the pages. I did find though, after years of networking and collecting business cards in books and boxes, finding that one card I wanted was difficult. Yes, I could see it easier by flipping through pages upon pages of cards in a book, but I still had to find it. If I needed that card while I was out and about, then I was in trouble. There was no way I was toting all those cards along with me every time I went out. There had to be a better solution. Fortunately, there is. Lots of them. Scanning your cards and uploading them to online databases is the easiest way to do so. Evernote has always been my preferred go to for storing information for later retrieval. Its ability to scan words, even in images makes searching really easy. Using the camera feature built into Evernote, you can take a picture of the card and store it in a notebook just on cards. When needed, simply search for a name, or even a keyword associated with that card (Something like “Mortgage” or “Legal” if you are looking for a Mortgage broker or Lawyer you once met) Evernote will see the keywords on the card and make them searchable. Shoeboxed is another service that takes your business cards, receipts and other documents and scans them for you. You just send them over to them in the regular mail and they scan them for you and make them accessible online. You can then take those scanned documents and sync them with your Evernote account or one of many other online storage spaces. Evernote also makes another app called Hello. While not a true card scanner, it allows you to enter information from a card, and have it pull information from the contacts LinkedIn profile and populate in a note on Evernote with all the details you need. You can also take a picture of the card and attach it to the note. These are just some of the different methods of using your Smartphone to throw out your old Rolodex and Business Card holders. Do you have a preferred method of tracking your contacts? Leave them in the comments below. If you like this blog post, please share it with others to educate them on tools to help keep them connected. 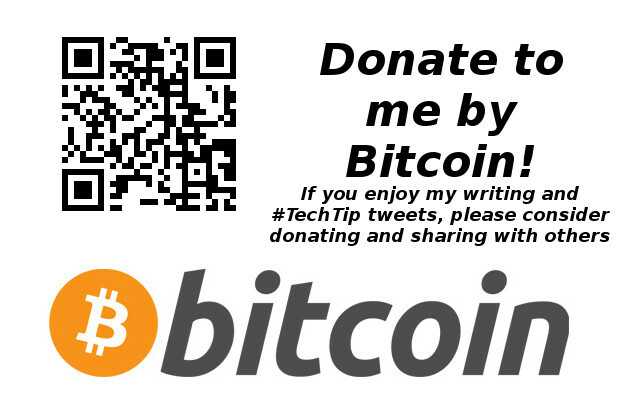 If you would like to make a donation to this blog to help fund the #TechTip tweets and blog posts, please feel free to do so by sending a bitcoin donation to my address. Why should my business accept Bitcoins when I already take Credit and Debit cards? Businesses need to offer as many choices as possible to make the process of buying your products and services as easy as possible. Unfortunately, it costs money in order to accept money. If you are not simply doing cash transactions, then you need to pay for banking fees, a Point of Sale system and the monthly fees that come associated with it, a percentage of all payment received for credit card transactions (usually around 3% but can vary) as well as the merchant account you need. All in all, accepting payment by credit card can be quite expensive and eat into your profit margins. 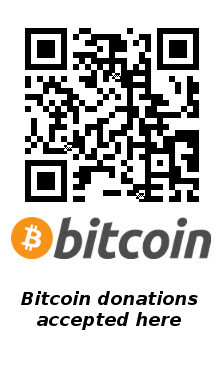 Bitcoin transactions can be exchanged for very little costs. In order to process transactions through the Bitcoin network, computers have to handle the transaction and record it in the general leger of all Bitcoin transactions. That takes time, usually an hour. If you pay a small fraction more, you can have your transaction sped up. The cost of accepting Bitcoins is probably around 1% or less of a total transaction value. As well as them being cheaper to accept than traditional payment forms, they are easier and safer for electronic fund transfer. When you buy something online with your credit card, you are providing your card number, expiry date, and the security code to the business. You can be sure they do their best to keep your information safe, however as we have heard about in the news recently, large data breaches in major retailers have led to the loss of millions of individuals credit card information. With those numbers, criminals can make purchases on your account. With Bitcoin however, a transaction can only be done between the two parties buying and selling. Once a Bitcoin transaction occurs, it can not be undone, and the information you provide for the payment can not be stolen and used to make other purchases. This benefits the consumer since there is little risk of fraudulent activity after your transaction. From a business perspective, accepting the payment means secured funds. Since a transaction can not be tampered with, the funds you receive are yours and there is virtually no risk of being clawed back. It is about as close to having cash in hand as you can get in an online world. There is a bit of a “What comes first?” scenario with Bitcoins. You want to spend your Bitcoins on things, but not many places accept them, and businesses don’t think they need to accept them since no one has them. As described above, the time and costs involved in accepting Bitcoins is fairly small, so it makes it worth it to investigate it. Consumers are starting to come more on board with the idea and are wanting to use their existing Bitcoins. It will create a snowball effect as more businesses begin accepting them, more people will start using them. Recently, Overstock.com in the US announced they would begin accepting them as a form of payment, and as of the time of this writing, TigerDirect.com announced they were going to begin accepting them as payment for products online. These are just 2 of the many businesses that are beginning to offer them as an option alongside their traditional payment methods. I hear the cost of Bitcoins changes rapidly. What if I make a trade for Bitcoins and then the price drops? Just like any currency or commodity, the value for Bitcoins has been fluctuating recently. This high degree of volatility may make some businesses worried about jumping on the bandwagon. For those that don’t want to play around with the risk of fluctuating worth of Bitcoins, there are merchant solutions that will handle the Bitcoin sale for you and immediately convert your Bitcoins into traditional currency. BitPay allows you to integrate their merchant services into payment process. You can then offer payment by Bitcoin on your website and have the funds converted into your home currency. They will then do daily deposits into your bank account with the value of your sales. Since you are getting the transaction value at that current price, you do not need to worry about how much the price for a Bitcoin fluctuates. Your money is safe, and in your traditional bank account. I thought Bitcoins were associated with a lot of criminal activity? Recent news has been about the FBI shutting down a website that offered illegal products and services in exchange for Bitcoins. The semi anonymous nature of Bitcoins has attracted some criminal activity online. In actual fact, Bitcoins do leave a trace online and are searchable. Although everyone has a unique and anonymous address given to them, all transactions from an address are part of the worldwide leger of transactions. This makes Bitcoins more of a security risk to criminals than traditional cash would. Therefore, Bitcoins should be less of an interest to criminals than cold, hard cash. Are there any downsides to Bitcoin? As with any option, there are always pros and cons. If you want to get involved with Bitcoins, there are a few things to consider. As mentioned previously, Bitcoins value fluctuates quite a bit. For the most part it is moving up, however if you are going to hold on to Bitcoins for a while, keep in mind that it can change in value compared to other traditional (fiat) currencies. Right now, acquiring Bitcoins is a bit of a challenge. You need to find someone in person to trade with, or set up an account with an exchange to convert. It is getting easier to buy them now with Bitcoin ATMs starting to spring up all over the world. While still few and far between, they are making headway. Making sure you manage your Bitcoins also requires a bit of thought. Many online wallets are available, but it is still best to keep them stored on a computer for security. Just remember if you do store them on a local hard drive, don’t throw it in the garbage without backing it up! There are many great places to start investigating how to get involved. The website www.bitcoin.org is a great place to get information on how to get started. There are a number of other resources online such as online wallets, exchanges, and Bitcoin businesses that are popping up that will help you get set up. Many major cities are also building up communities of Bitcoin enthusiasts who are more than willing to share their knowledge. If you are a small business and want some guidance on where to look for information on Bitcoins, feel free to contact me by Twitter @Stealth2377 or fill out the contact information below. If you enjoyed this post, found it informative and useful, please share it with your friends on Social Media, and consider making a donation to help keep this blog funded. #TechTip Setup your voicemail to forward messages as email attachments. Then you have a record of all messages. I have had a lot of people interested in finding out more about this Tech Tip of mine. First, lets start by getting one thing clear: While it can be easy to set this up, its not a one step process and may invoice extra fees. Many people in the corporate world may be familiar with this feature that logs all their voicemails as email messages. Major phone systems have been able to do this for years, including systems from Cisco and others. For small businesses and individuals, there may be a few steps you need to take. All of the wireless carriers will provide voicemail service with your phone. The basic service just records your message, but sometimes the enhanced services will offer features like Voice to Text emails. This feature will take your voice message, have a computer analyze the recording and turn it into a plain text file that is then emailed to you. (Often with a voice attachment included) Telus I know does this, and Rogers has their Visual Voicemail Plus service which offers something similar. The enhanced services often cost extra, but you may have them bundled into a feature package. If you are not sure if it is set up, or if you have it, give your wireless provider a call and find out what steps you need to take to set it up. Although its not available in Canada (yet! ), Google Voice offers a service where it will take your message, and send you an email and/or text with the transcript available, as well as the voice attachment. The Google Voice App also will send the message direct to your phone for quick play over a data connection instead of having to call in. Google Voice has been very slow in deploying outside of the US, but rumours are that they want to increase their presence and Canada is the most likely next target. I have used Google Voice myself for quite a while now using some sneaky work arounds and have been quite impressed with it. 1 Number calling: By Providing everyone with a VoIP number and having them call me through a VoIP phone system, calls can come to my office phone, and wireless phone at the same time, and if I don’t answer either, it goes to the Phone system voicemail. That service then texts me and emails me to let me know there is a message. I just download the attachment and listen to the message. Cell phone forwarding: If everyone already calls your cell number, then you can try the call forwarding trick. Check with your provider if you have Call Forwarding on your account, and activate the “Call Forwarding – No Answer” or “Call Forwarding – Unavailable” feature. This will let your phone ring for a period of time, and if there is no answer, automatically forward to a phone number you designate. Set up a phone number with A VoIP provider (Either a phone system or directly with a VoIP provider) that offers voicemail service and Voicemail-to-Email. Direct your calls to forward to that number if you don’t answer your cell. Once the VoIP provider picks up the voicemail, it will convert your message into a file and email it to you. There are a number of providers out there that can do this, so before you make a decision, find out if you just need voicemail, or want to have a VoIP phone line that goes with it as well. As mentioned, there will be some additional costs these ways, but depending on how important it is, it may be worth it. Typically costs for any service like this can range from a couple of bucks up to maybe $15/month. VoIP is an ever changing environment, and with new entrants possibly coming into Canada (Again, I’m looking at you GOOGLE!!!!) then expect features to improve and costs to come down. If this has still peaked your interest, contact me and I can put you in touch with some options.